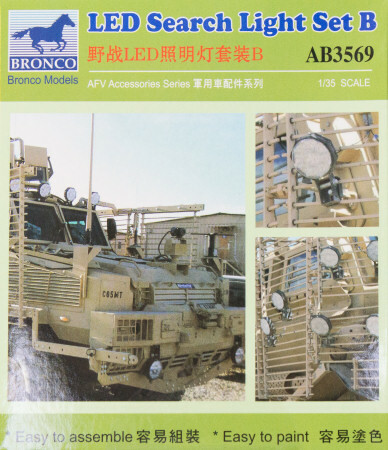 Bronco Models produces an interesting range of kits and detail sets. Here is one of three new sets that are 1/35 scale LED lights as used on off-road vehicles and most notably MRAPs. There are a variety of LED lights that are adapted to mount around MRAPs including fixed round lights, fixed rectangular lights, and positionable round light fixtures. Since LED lights draw significantly less power than Xenon and other bulb technologies, lots of these lights can be installed on a given vehicle without draining available vehicle power. One of the problems with mounting these lights is finding existing bolts to use because drilling through the armor to mount these lights is not an option. With the adoption of slat armor on many MRAPs to defend against RPGs and other anti-tank weapons, these lights can be easily mounted to the slats. In this set, Bronco provides 28 round LED fixtures with the housings molded in tan styrene (odd since most are black), lenses provided in clear styrene with the distinctive LED lens shapes, and mounting brackets provided on two small frets of photo-etched parts. The instructions show you how to wrap the photo-etched brackets around the slat armor, but any of us with Jeeps will be comfortable mounting these lights in any case (I converted my Jeep to LED lighting last year). This is another nice detail produced by Bronco and the other two sets also available will provide the rectangular and positionable round lights as well. Thank you Bronco Models!